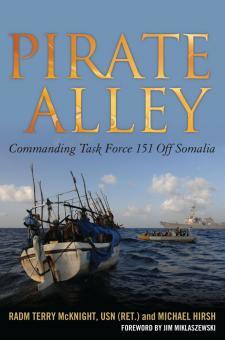 Pirate Alley - Doug Grad Literary Agency, Inc.
With piracy on the rise and fast becoming a serious global security issue, Admiral Terry McKnight took command of a new multi-national task force in 2009 to combat piracy in the Gulf of Aden. As task force commander, he directed operations that disrupted several hijackings and resulted in the capture of sixteen Somali pirates. After running head-on into a U.S. policy of catch-and-release, he realized that there was more to fighting piracy than just catching youngsters armed with AK-47s and RPGs. McKnight retired from the Navy and began researching the problem. This book, co-written with journalist Michael Hirsh, is a very readable yet authoritative introduction to the subject. The authors explore every aspect of Somali piracy, from how the pirates operate to how their actions have impacted the world economy. They examine various attempts to solve the problem, including placing armed guards aboard merchant ships, and highlight the best ways to outfit ships for travel through high risk areas. But they warn that a consequence of successfully protecting such targets as container ships and crude oil carriers may be that pirates turn to crime on land, such as the kidnapping of foreigners. In addressing the worldwide economic impact of piracy, they note that piracy costs as much as $13 billion a year, and in 2011 took 1000 seafarers into captivity. One shipping company argues, however, that over-reaching shipping regulations have a greater negative effect on the economy. The book concludes that in the interest of justice and to protect the free flow of commerce throughout the world, the United States government needs to take additional measures to stop the flow of U.S. dollars for ransoms payments that serves as the only reason for piracy in the region. With a foreword by Jim Miklaszewski. RADM Terry McKnight, USN (Ret. ), is a thirty-oneyear Navy veteran who rose to command the amphibious assault ship USS Kearsarge and served as the first commander of Combined Task Force 151. He lives in Fairfax Station, VA.
Michael Hirsh, an Army combat correspondent during the Vietnam War, is an award-winning journalist who has produced documentaries and specials for PBS, CBS, ABC and HBO. The author of six other books, including None Braver—U.S. Air Force Pararescuemen in the War on Terror, he lives in Punta Gorda, FL. ~ Check out Terry McKnight's website.